When I assisted my mother in purchasing a car in early 1966 I was 19 and about to enter my Senior year of college, still living at home in Northern Kentucky. I wasn't quite ready to buy my own car at that time (although I did buy a 1962 Corvette - that I also still have - in March of 1967). My mother was looking for a station wagon to use in her job of selling sundries to independent drug stores. 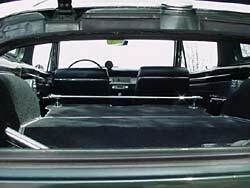 Since I knew this would be my car to use on weekends and summer evenings,a station wagon was not a cool ride, so I sold her on the storage space of the Barracuda with the fold-down rear seat as an alternative to the dreaded station wagon. She could only drive a stick shift, so I didn't need to argue against an automatic, nor could I sell her on a 4-spd. 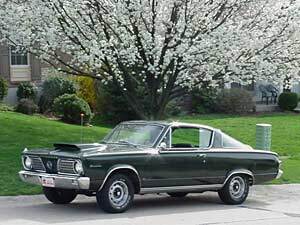 We didn't have much $, so any options would be a battle - that's how we wound up special ordering a \6, 3 on the tree, padded sun visors, heavy duty suspension '66 Barracuda. We requested dark metallic green with a white interior (she wasn't excited about the white, but It didn't cost any more, so I won out on that with her) - unfortunately Ma MOPAR nixed this color combination and I wound up with the black interior instead. We found a couple other strange things, too. The '66 brochure featured a dark green model with thin yellow stripes on the side that looked neat. The buyer did not have the option of ordering a side stripe color, so I figured, if we ordered dark green, we'd get the yellow side stripes. Wrong! It came with black side stripes (barely visible). I was a little disappointed, but just happy to have a NEW car. 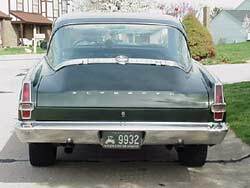 Since then, I don't remember ever seeing a dark green '66 with yellow side stripes except for the one shown in the brochure. Also, we special ordered it with no radio. When it arrived a few weeks later, there was the radio delete plate on the dash where the radio would have been AND a shiny new antenna sticking out of the right front fender and the antenna cable wrapped around some other wiring under the dash. My guess is that most cars came with radios, so they got carried away and installed antennae on all the cars (or maybe the car was built on a Monday). Anyway, for about a year, she had her daily work vehicle while I was able to be at least marginally cool on weekends. 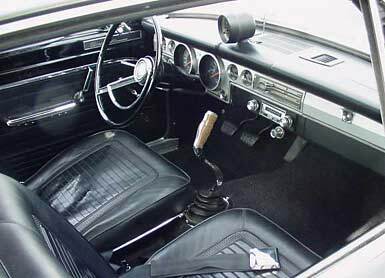 The next year I got my Corvette and was way cool - no longer caring a rat's pitut about the Barracuda. Mother drove it for many years until retiring. The Barracuda for the most part sat in the garage except for an occasional trip to the grocery and yes, to church on Sunday! Then, as Alzheimer's grip tightened on her, she could drive no more and the car sat in the garage for months at a time. I had gotten married in 1970 (still have the same wife too!) and had a company car in addition to the Corvette, so had no real use for the Barracuda. The low ebb of the Barracuda's existence was when I offered it to my 17 year old daughter around 1988 if she wanted it for her first car. Surprisingly she said 'no thanks' - it wasn't cool enough - it was at that point, just an old car, so back to mother's garage it went. Shortly after that I decided, what the hell! 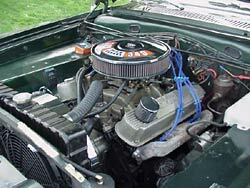 Why not try to convert it into the Barracuda that I really wanted in '66? The transition began. In no particular order I had it repainted its original Dark Metallic Green, got some 14" Rallye wheels and rebuilt the \6 with a bigger cam, headers, dual exhaust, dash tach, 390 Holley and chrome engine trim. 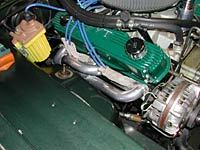 After doing this, I discovered the 7 1/4" open rear end with a 2.93 gear didn't work with the performance cam. I put in an 8 3/4" rear end and -get this- a 4.56 Sure Grip! Talk about a stump pullin' \6 - but way too much gear. I then put in a 3.55 that was, to quote Goldilocks, "Just Right!" Well, after a couple of years of \6 cruisin', I gave in to the V-8 urge and put in the first 340 and hooked it to a 2 1/2" exhaust, a 4-spd with a 71 b-body Pistol Grip shifter and put in a 3.91 gear - a great set-up for a street cruiser, but again, too much for the annual pilgrimage to the Nationals. Tends to overheat, bad gas mileage, bad top end on the expressway. I now have a 3.23 which is the best compromise gear for normal use. It will pull nicely off the line and still gives a good top end on the expressway. I put the battery in the trunk, found a junk hood and put a 6 pak scoop on it. I installed 'race readies' which are easily removed exhaust cut-outs that I open from time to time when I need a real hillbilly fix! Love that sound!! 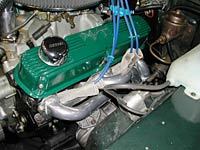 I put in another 340 a couple of years ago and installed some Spitfire headers - just wanted to go a little faster. I came across a set of small bolt Keystone wheels that I brought back to life and put 'em on just to give it a different look from the Rallyes. I've got some front disc brakes that will probably be my winter project this year. Until a couple of years ago, I had a '64 Stingray coupe along with my '66 Barracuda. I would get a bit of a rush whenever I opened the garage door and gazed upon two of the neatest back windows ever. But reality set in: you can only drive one car at a time, and I was up to four collector cars, storage was getting to be a pain, so I had to thin out the herd. Two Chevys (the Stingray and a '61 Impala 409 SS) got put out to pasture. My mother died last month at age 97. I think she's happy that her 'machine' lives on.